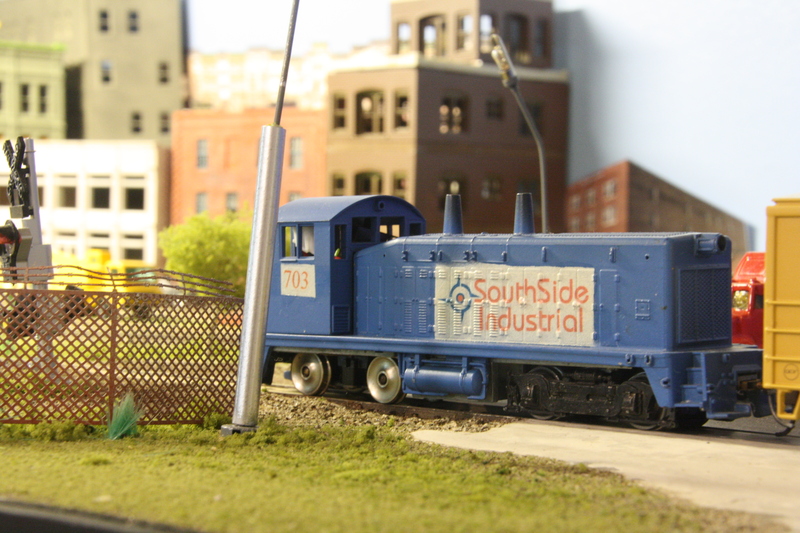 Southside Industrial District in shadowbox relief. When 2015 started, I had three major goals to achieve for my HO industrial switching layout. I am pleased to say I made major progress on two, while considering the proscenium arch completed. Scroll down through the blog to see construction articles. More on the London Underground coming in 2016! 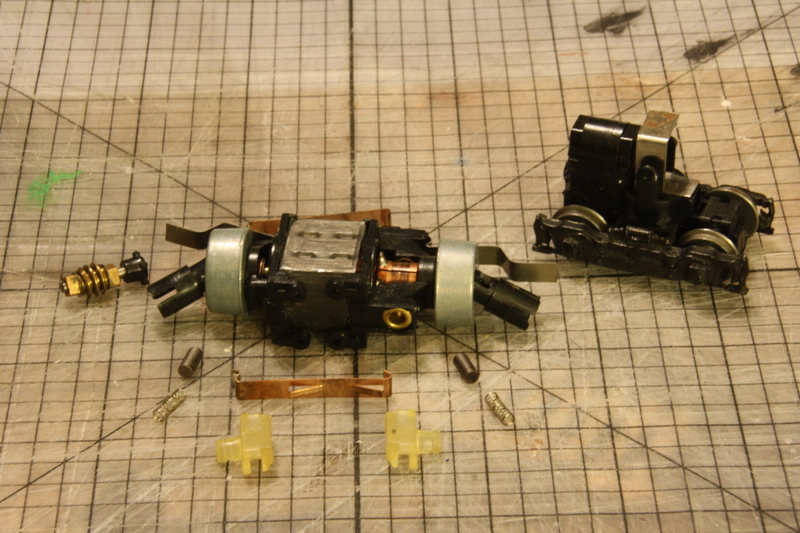 Radio control installed and working, but still some work to do on the shell – hand rails and weathering. 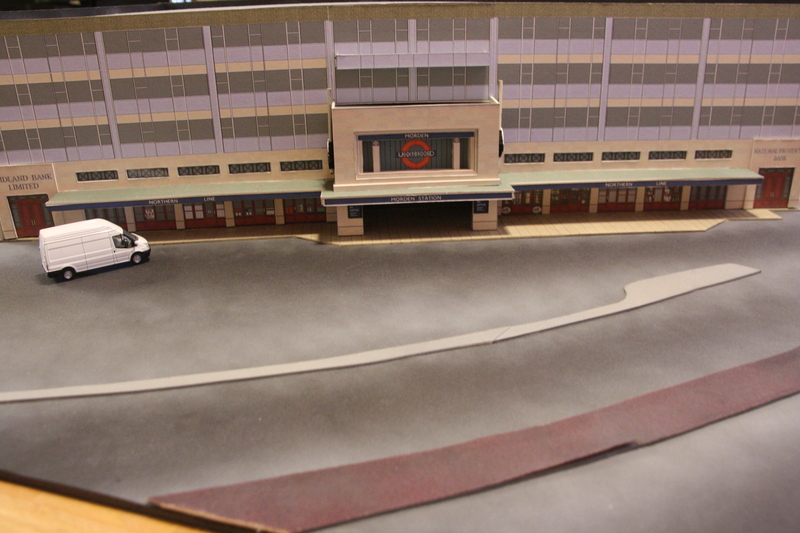 While the bulk of Morden station is complete, I’d say the entire diorama is maybe 40% complete. 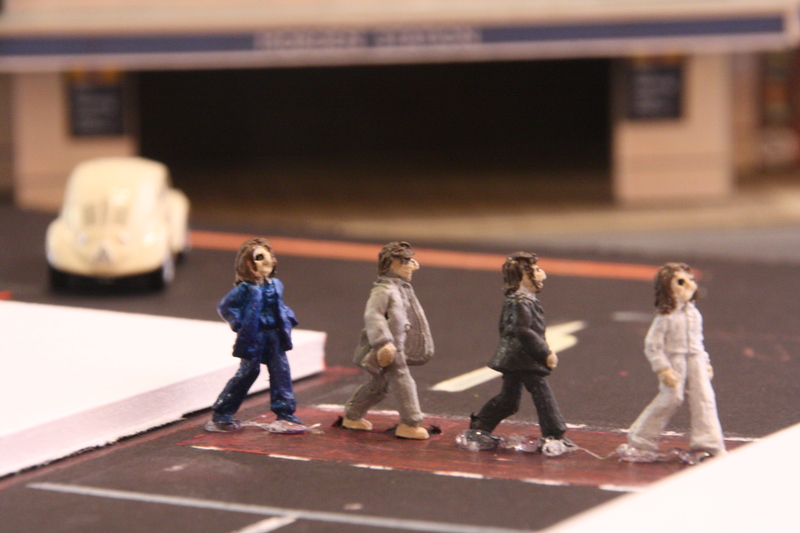 I still have detailing to do like street markings, figures and general clutter. I’m also going add a couple of levels below grade to show some underground passenger service. Rather ambitious, but I hope to get it done with a little help from my friends. 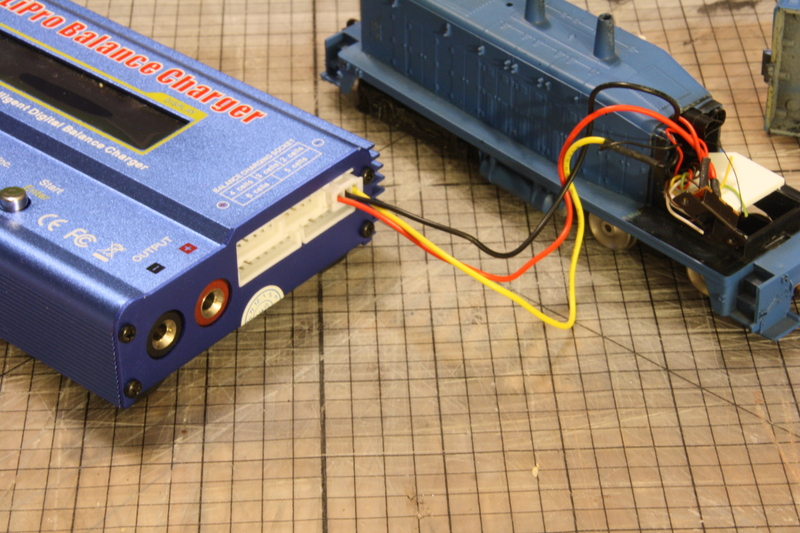 For several months now I have been reading about using battery powered radio control to run HO locomotives. This seemed a good fit for my industrial switching layout that had recently been moved to the less-than-perfect climate of the garage. My research piqued my interest and I thought I would give it a try on an aging model I had nearing its end of life. I selected my sentimental favorite – an Athearn blue box SW1500 (actually an SW7) that I purchased new with my hard earned yard mowing money around 1978 or 1979. For some reason I painted the shell Conrail blue, but never got around to decaling or detailing it. It’s seen a lot of use and wear over the years and is still used in most of my industrial switching operating sessions. 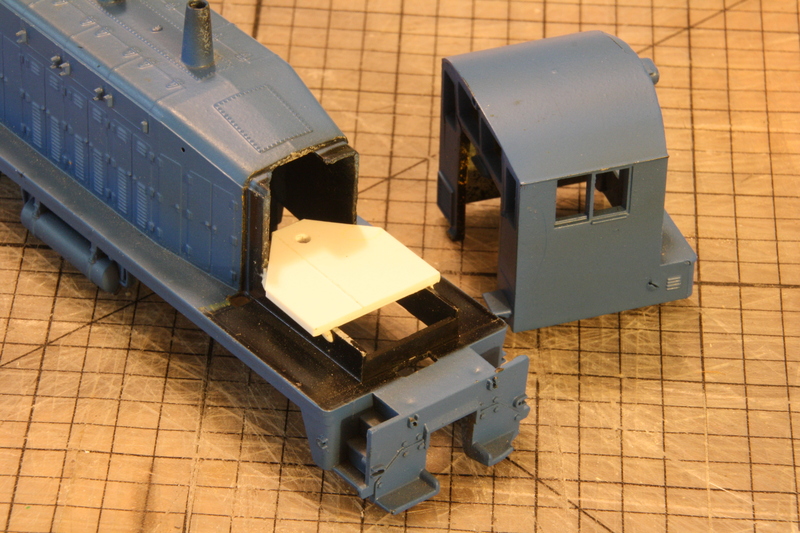 This project actually started a few months ago and consists of two major phases: first, upgrading the 70’s motive power of my Athearn blue box SW1500, then adding the radio receiver and batteries to fit within the shell. Needless to say my 36-year old locomotive was running a bit, ah, stiff. In actuality, not too bad considering, but the sintered wheels needed frequent cleaning – sometimes after only 40-50 minutes of running. There are plenty of web sites showing how to pimp your blue box loco, but even the most extreme tune ups either tweak the motor or replace it with one essentially the same size. I might have been able to fit the receiver and batteries in the SW1500 cab, but I wanted to try the latest generation of self contained power trucks. There are a couple of choices available, including Bull Ant and Stanton drives. After doing a little research, I went with a Stanton power truck available from Northwest Short Line because I was seeing some good things on the Internet. 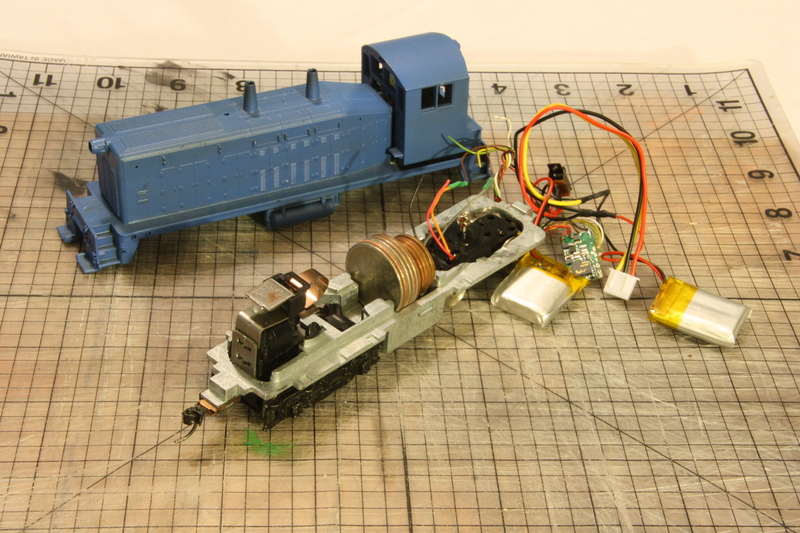 Phase I – repowering the Athearn loco. You can skip these steps if you are tuning up your motor or replacing it with a full size motor. I started by taking the shell off the Athearn unit. Then I took the motor out by disconnecting the universal. For the Stanton replacement, you won’t need this any more. I also removed the truck I would be replacing with the power truck. I choose the rear truck under the cab because there will be more room there. As for the other truck, you’ll need to make it free rolling. Do this by removing the top of the mechanism case and removing the worm gear. Replace the cover to the case. Northwest Short Line (NWSL) has quite a range of products for powering your locomotive. For the Stanton self powering truck, you’ll need to select the wheelbase, wheel diameter, and tread thickness. Their catalog walks you through how to do this. Luckily, since I was replacing a currently operating power truck, I simply measured my existing hardware and used their ordering chart to select the proper part number. At this point you’ll need to find a way to attach the Stanton truck to the frame. I’m not a mechanical engineer and this was a challenging part of the project. 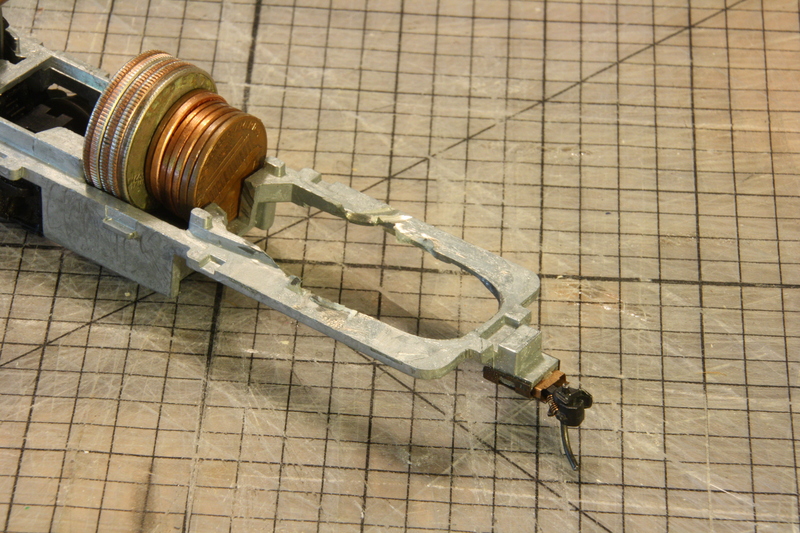 The Stanton drive comes with a “king pin” centered in the middle of the drive to attach to the frame. The trick is to find a cross member in the proper place and at the right height to place the drive. After test fitting the apparatus, it was also obvious that the drive was to tall to move freely under the frame, so I ended up having to remove part of the frame. Basically, I needed to make the hole bigger and I did that with a Dremel tool. After a few trail and error grinding episodes, I was satisfied that the drive would fit. Now came time to attach a cross member through which I drilled a hole for the king pin. I did that by using a sheet of .060 styrene. More trial and error was used to attach this to the frame using various adhesives. I finally got a secure placement I liked and test ran it. Seemed to work. Then I added the shell to the frame. Uh-uh. No go. The shell fit snuggly to the frame with no excess room to attach the styrene sheet. What to do? From this point on, I worked with the shell attached to the frame so I knew exactly how much room and clearance I had to work with. I came up with a system to get the sheet of styrene to span to ridges on either side of where the cab attaches to the rest of the shell. See the photo. It turned out that the front edge of this ridge is right where the hole for the king pin needed to be and there wasn’t enough room at the end of the styrene piece. So I cut off the two front corners at a 45 degree angle and was able to slide the styrene a bit closer to the front. 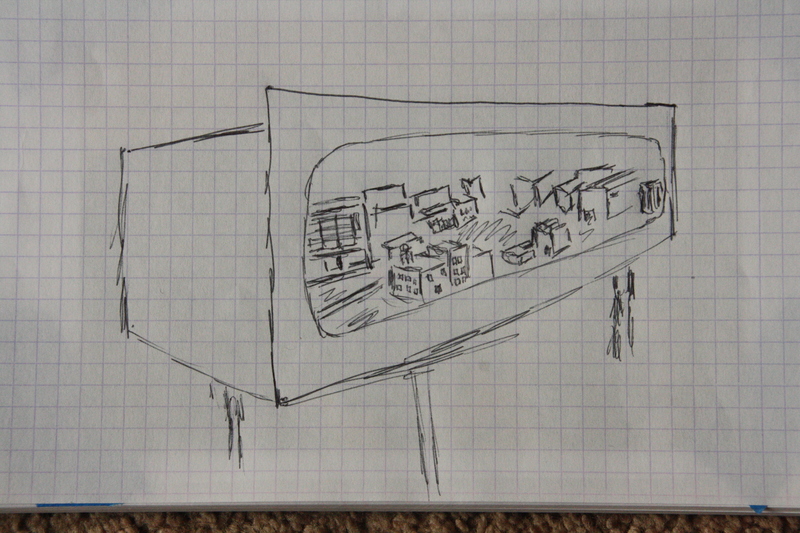 That gave enough room to add support around the place where the hole would be. I placed the shell / frame over the truck so the king pin touched the styrene. I marked the spot and drill the proper size hole according to the instructions. The fit was a little tight, so I widened the hole just a pinch with a nail slightly larger than the hole, as well as a smidge extra using my hobby knife. I secured the styrene to the shell using 2-part epoxy on the inside, and Testor’s liquid cement for styrene on the outer joint. It ended up that the top of the king pin clears the styrene surface by the smallest acceptable margin. Just enough for the nut to whole the whole thing in place. A thinner piece of styrene would help this problem. A run around the test track confirmed proper placement and let me adjust the height of the shell by a small tweak to the lower nut of the king pin. 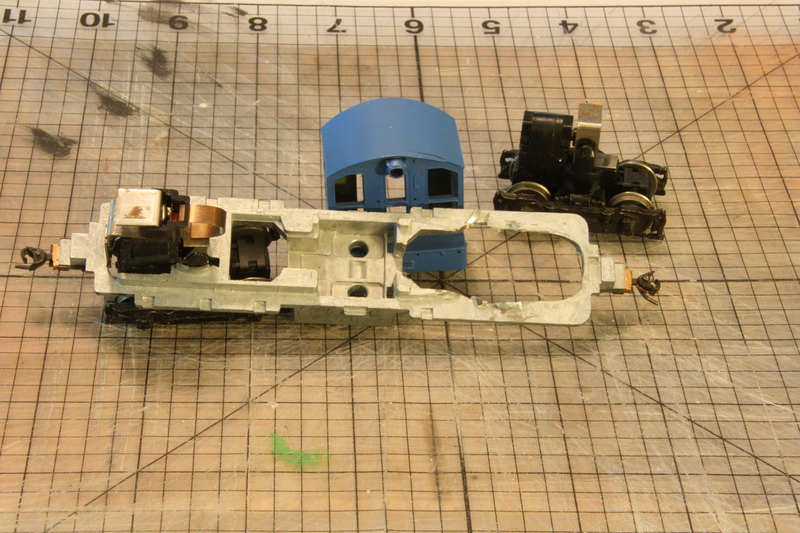 You’ll want to add some weight to account for the removal of the motor and the rear Athearn truck. There is plenty of room in the center well where the motor used to go. I used pennies and quarters glued together with super glue. You can use your favorite method of adding weight. 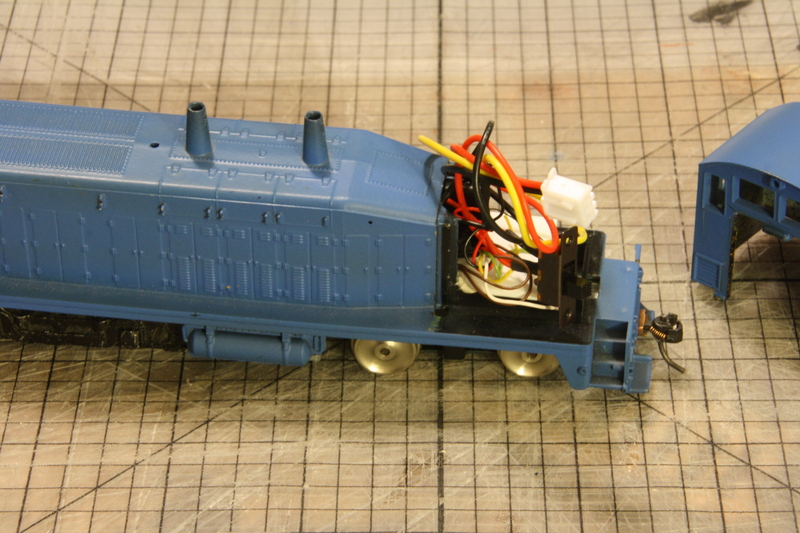 Remember, the Stanton truck comes wired for DC out of the box, so at this point we have finished the first phase of replacing the stock Athearn motor and are ready to go. Go ahead and test your locomotive on track or your layout. Be sure to check the vertical clearance with the truck and the shell, as mine had little margin for error. Make certain the trucks move freely through curves and turnouts. Correct any running problems now because adding battery power won’t fix mechanical issues. You’ll just have a battery powered engine that has problems through curves and turnouts. The next phase is to add the radio receiver. There are many options, but like I said, I went with the DelTang system. 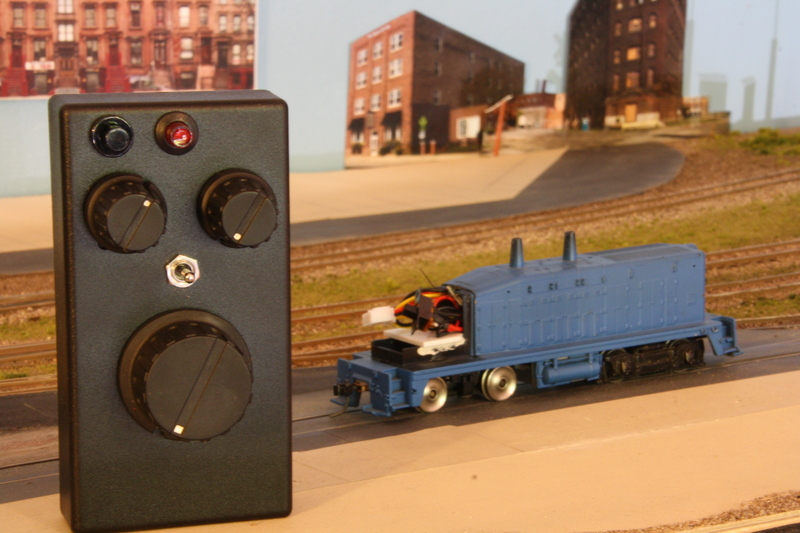 The Stanton S-cab system, which is a combination of radio control and DCC, looked promising. However, I wanted to keep it simple and not have to be tied to DCC. It looked like I could get up and running fairly quickly, even though I would have to forego sound initially, which was alright by me. DelTang is manufactured in UK, so you’ll have to find a US importer. I went with the On30 Guy, who has excellent information on his website. He even packages together a starter kit, which is what I went with. 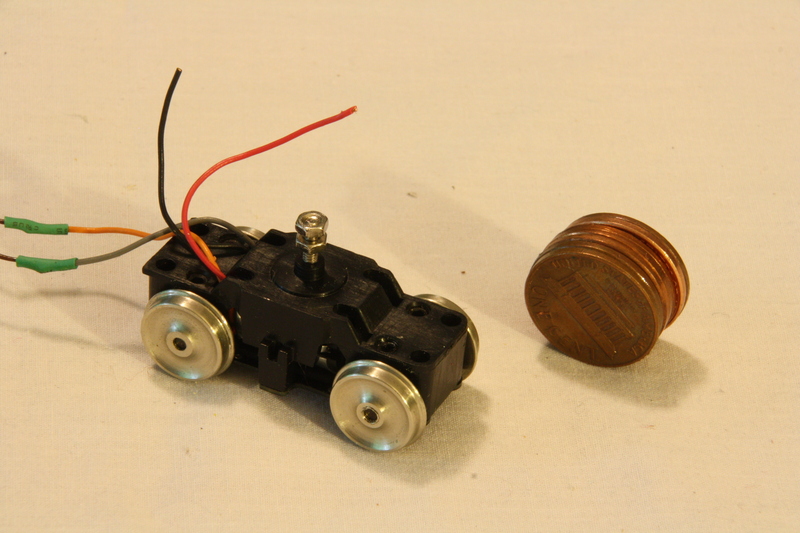 The starter kit comes with a transmitter for up to 12 different locos (dubbed the “Selecta” feature by DelTang), a receiver, two LiPo batteries, and on/off switch, connectors and instructions. Recharging LiPo batteries must be done carefully, so I also procured a charger for specifically charging packs of multiple LiPo batteries. The entire was just over $200, including shipping. You could probably order the batteries and charger cheaper from different sources on the internet, but you’ll also have to factor in separate shipping charges if applicable. 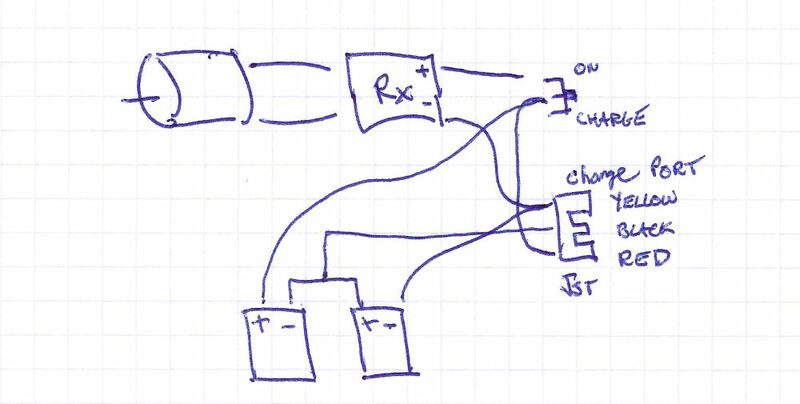 The simplest configuration for wiring up any receiver is four wires: two to the power source and two to the motor. See Figure 1. 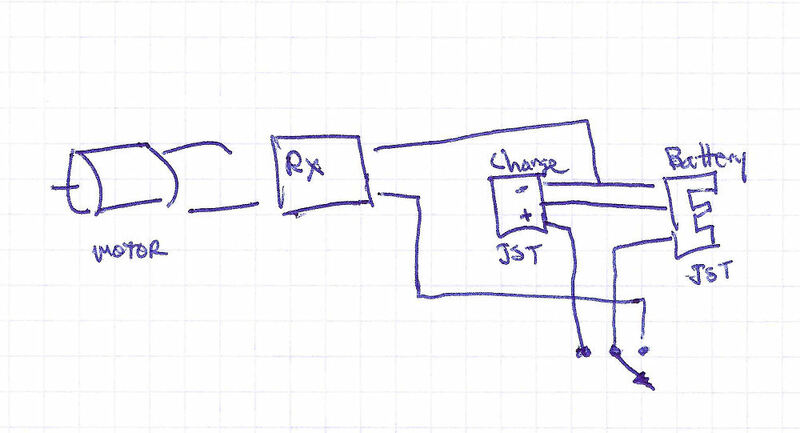 The basic configuration for wiring a DelTang to rechargeable batteries is a bit more complex, and the straightforward instructions from the On30 Guy walk you through it. You’ll want to include a recharging port and an on/off switch. More advanced options include directional lighting and switch options, which I chose to omit. You can check the DelTang website for advanced features and even programming. 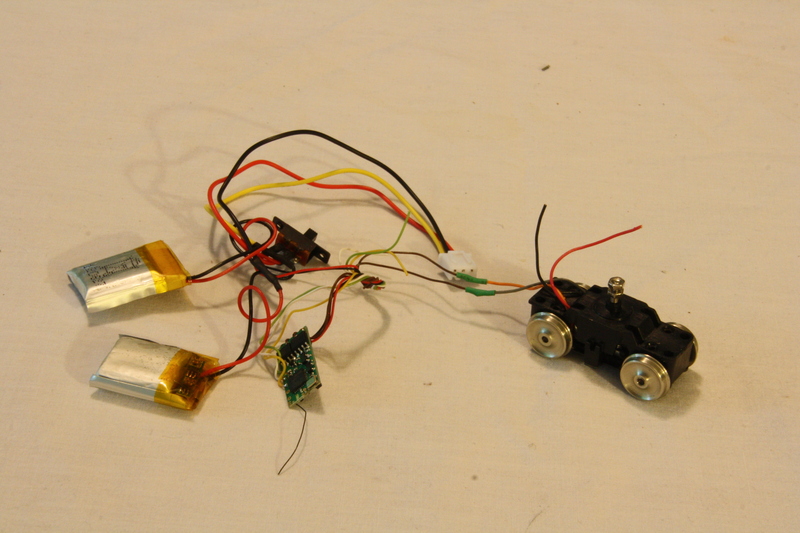 A single cell LiPo battery is 3.7 nominal volts – not enough to run an HO engine. You’ll need to make a multi-cell pack or wire in a step-up regulator. I chose to create my own two cell battery pack wired in series (2S). Again, On30Guy to the rescue with all the 411 you’ll need on how to do this. See Figure 2. 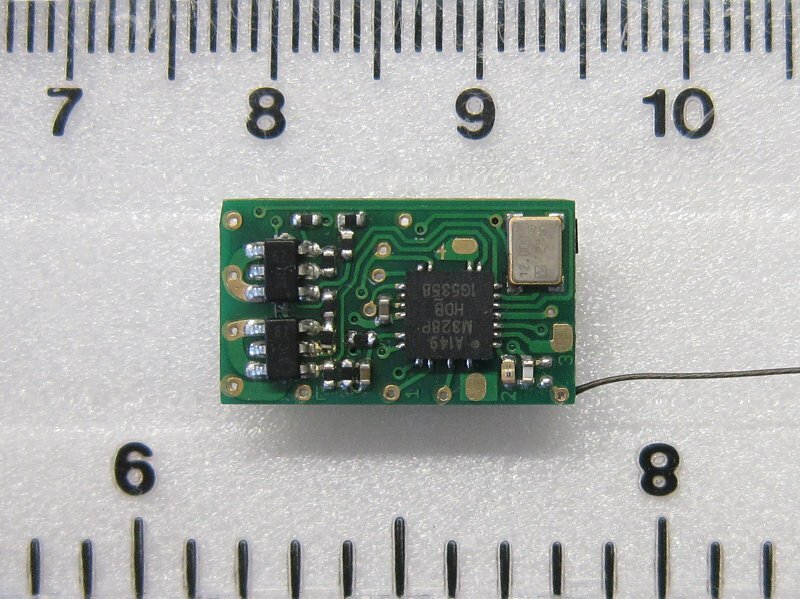 Being a micro electronics application, some of the wires and connections are quite small. You’ll need soldering skills, understanding of basic electronics, and knowledge of how to read a circuit diagram. I coerced my friend Ian Currey to wire it up for me. It took him a couple of hours. See Figure 3. At this point the receiver, battery, and motor (Stanton truck in my case) are all wired up and must be attached to the frame. Per alterations mentioned above, my power truck, in fact, attaches to the shell, which must already be clipped onto the frame when the rear truck is attached. You’ll also want to have any weights added to the frame at this point. Now’s the time to test your circuitry along with the transmitter. Just lay the unit on its side and go through the binding function and the other transmitter features. You’ll want to read the DelTang documentation to check out all the features of the transmitter and chip, including binding, “Selecta”, momentum and reprogramming for center-off “yard mode”. I attached the shell to the frame, and then positioned the truck with kinpin under its anchoring hole. 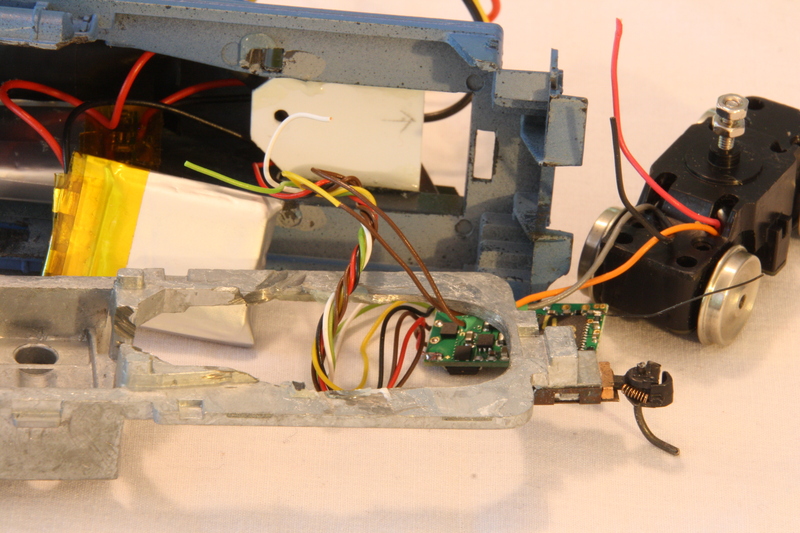 All the while, I was stuffing the electronics into the shell. The batteries went the farthest forward, then the receiver. The SPDT on/off switch and charging port were kept close to the cab for easy access. Finally the truck was secured to the shell via the kingpin and bolts. You can quick check the receiver again by turning on the unit and making sure nothing came loose during the last step of the install. If everything is still OK, you are good to go. Place your loco on your layout and take her out for a spin. Turn the transmitter on first, then the receiver. 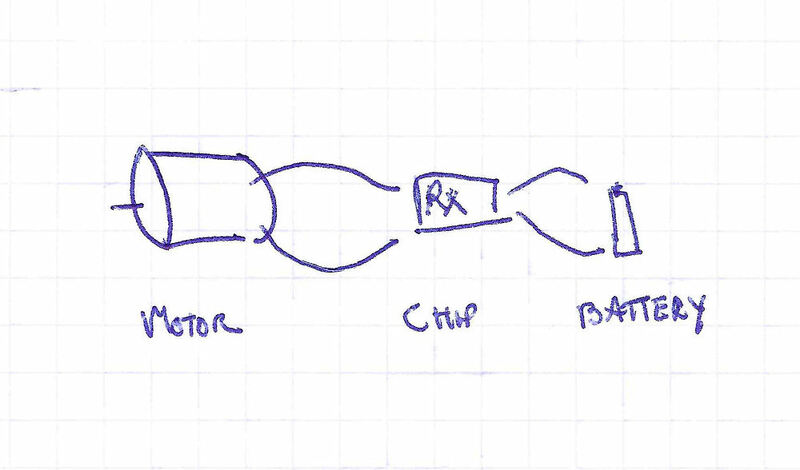 The one thing I noticed right away was that to change direction in low-off mode, you have to turn the rheostat completely off (to the left) before the change of direction is applied. Most sources on the internet rate the battery life at about 2 hours, maybe sometimes as much as three. For me, it didn’t seem that long, though I can’t say for sure. I ran the engine 10 – 20 minutes at a time on switching duty. I didn’t keep strict records, and furthermore, I can’t confirm what the starting charge was the first cycle, so I had no way of knowing how long the first charge lasted. Regardless the duration of your charge, at some point, you’ll need to recharge your batteries. All the literature states that LiPos can be a bit tricky and care must be taken. You need a charger specifically for LiPo batteries (or whatever type you use). The On30 Guy sells, and I purchased, the iMax B6 charger. Its versatility can make it overwhelming, but Geren’s instructions at the On30 Guy and a trip to the inter-webs gave me all the information I need. You’ll need to fashion a custom lead to monitor the balance charging per Geren’s tutelage. 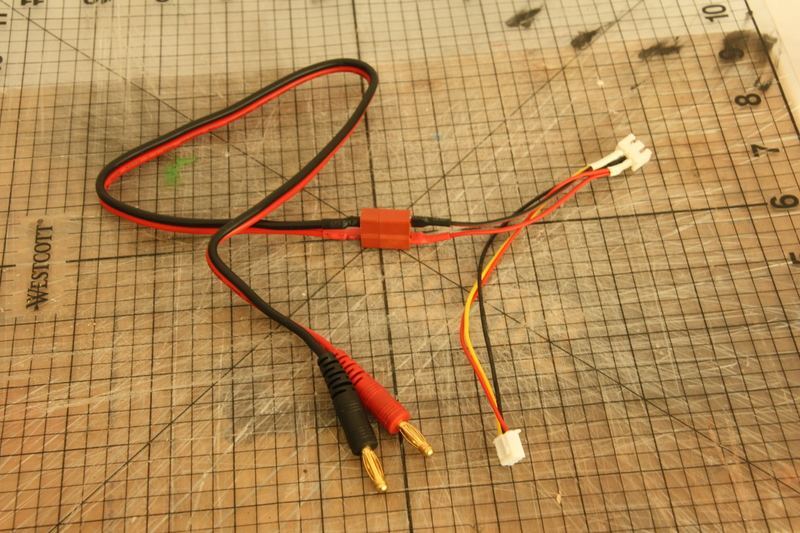 I also needed to fashion a power lead from a couple of cannibalized power supplies. Another session with my friend Ian and I was off and running. Worked like a charm. Following the instructions, I recharge the 2 cell battery while it is still within the shell of the locomotive. Currently, I remove the cab to charge, as well as to power up. Sideframes, details, decals, and weathering complete the model. Possible upgrades include directional lighting, reprogramming for “yard mode”, a magnetic on/off switch, and exposing the port for charging. Look for a progress report in upcoming posts. I’m really happy with the results of both the insertion of the Stanton drive and the conversion to battery powered radio control. This is my first non-DC setup and I love the slow running which is ideal for switching chores. Another plus is that living in the humid southern United States, I don’t have to worry about cleaning dirty track or locomotive wheels since my layout is located in my garage. Wiring reverse loops, turntables, block control, DCC power districts, power frogs and layout shorts are a thing of the past. Fuggetaboutit. It’s been a long journey and I’ve learned a lot. The sidebar above shows the approximate cost of the rebuild, along with a comparison of the cost of converting a second model. Assuming the cost of the Athearn engine to be a conservative $15.00 in the late 70’s, you can see I’ve got upwards of $350 invested in this little switcher. Without any motor refitting, subsequent conversions will only be the cost of the DelTang receiver set – about $60.00. Most of the other members of my engine fleet have acceptable mechanisms, so I don’t anticipate repowering those. But with one R/C conversion under my belt, I hope to follow up with more and expand my radio controlled roster. Don’t be surprised if someday you see a remote control critter running around the Southside Industrial District – one that was bought with hard earned “yard” money.